Follow Friday Fun Week 3 - this weekly meme is hosted by Parajunkee. Check out her blog for details/rules, and to join! Also, she's hosting a fantastic giveaway this week, so be sure to check that out! This week's question: Genre Wars! What's your favorite genre and which book in that genre made it your favorite? 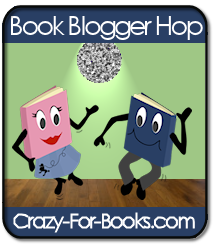 Book Blogger Hop Week 4 - This is a weekly meme hosted by Crazy For Books. Be sure to stop by her blog to check it out! This week's question: How many books are currently in your to-be-read (TBR) pile? My actual physical pile? Eleven - all library books that I've obsessive-compulsively collected over the last few weeks even though I'm a slow reader and won't be able to get through them all. As for my TBR list, probably over a thousand, and growing every day. When Facebook used to have the Virtual Bookshelf feature, I had about 900 books in my TBR list, and it's grown massively since then, so I really can't even imagine how many there would be if I made a new list and counted! Maybe I should do that on GoodReads? New follower here. I love Nora Roberts. I have six of her paranormal trilogies on my shelves as we speak. My mom got me started and never got her books back. LOL! Have a great weekend. Hi, I'm a new follower I'm a sucker for romance too! Hopping by from the follow friday. Le *sigh* I love Nora Roberts, I am only a few books short of having her whole collection! I'm on GoodReads. Come read my Book Blogger Hop post in which I discuss my TBR and coin a new way of measuring it. I have wau too many books on my TBR list and TBR pile.All total that comes to sixty books. Now here's the scry math:I read roughly onr book per week - some times two . But two to three books are being added to my TBR list every week. Hope on over to my blog - http://www.howardsherman.net and find out why. I find that picking one particular genre is super hard too! I seriously had to think this question over for a while trying to decide whether I should just list them all or put the top two (dystopian and urban fantasy, just by a bit). To be honest, I've never read anything by Nora Roberts before but now I think I'm going to soon! :) She sounds awesome from the way you describe her! Hey, cool answer, Nora Roberts!? I have one of those kicking around on my shelves! Her writing is HOTT! Also, thanks for following me! My favorite genres are historical fiction and myteries. I have 29 books in my physical to-read stack. I hope I answered the question correctly.